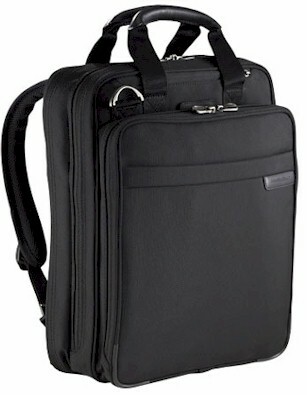 The vertical packing option allows this brief to be used as a backpack or as a traditional computer brief. And the three section design provides organization. On the Outside This case is made with water repellent self-healingabrasion and color fading resistant 2520 denier ballistic nylon. And the zippers are heavy-duty oversized self-repairing YKK zippers. Available in black. All these features found through out Briggs & Riley's briefcase collection. In the Inside this piece has excellent organization features. The front section is an organizer for palm PDA CD's etc. The middle section houses the computer with a removable computer sleeve. The back section is a fan file for legal size folders. And the removable accessory pouch is an added extra.